Sharks and rays belong to the class of fish with skeletons composed of cartilage, not bone. How can sharks see in the murky water? Unlike humans are sharks' eyes equipped with a layer of mirrored crystals behind the retina. This provides for light to be detected a second time. Light is defused, acuity reduced and sensitivity increased. Such an adaptation enables sharks to see even in low light and dark murky water up to 10 times greater than humans. Why do white sharks roll back their eyes? Also unlike humans, shark eyelids serve to protect the eye when attacking prey. Some sharks have a clear membrane that covers and protects the eye when a shark bites its prey. 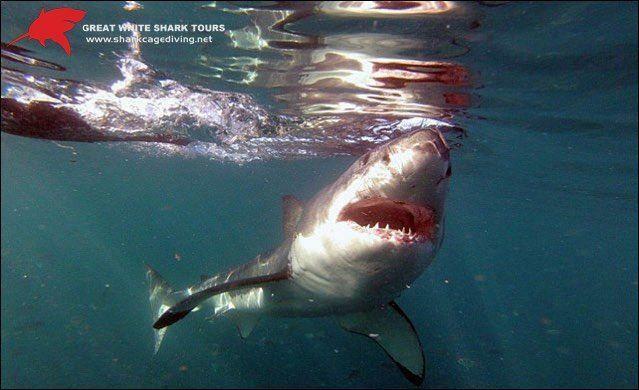 Great White Sharks lacks this membrane and therefore roll their pupils back in their heads for protection when feeding. Yes, a white shark will feed on a dead whale; however, they have never been observed attacking a healthy whale. 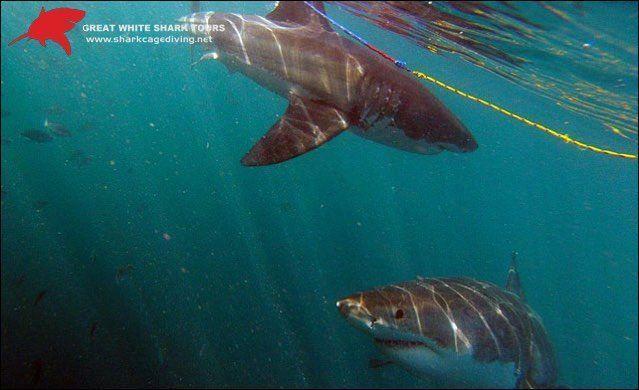 How deep can a great white shark dive? The deepest recorded great white dive was in New Zealand and was over 1200m, giving new meaning to the term "Down Under". Why is it called a white shark? How long can a shark survive without food? Months may pass between meals when the pickings are slim. A large shark can eat up to 10 tonnes of meat in a year. How do sharks detect their favourite meal - seals? 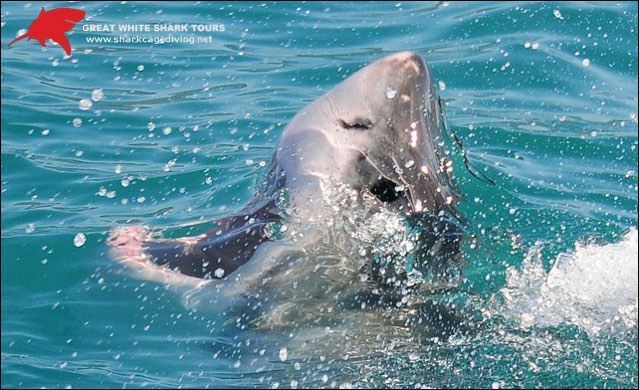 Two small sensors in the skull allow the shark to zero in on the splashing sounds of a wounded seal or a fish. Unlike other habitats, the seals of Geyser Rock do not form larger groups to avoid sharks. They may use the surface kelp to disguise their silhouettes, making it difficult for sharks to detect and attack individual seals. Dogs, monkeys and dolphins all show expressions akin to human smiles. But in sharks and other fish, the parts of the brain related to feelings are less developed. Sharks smiling? Not Likely. 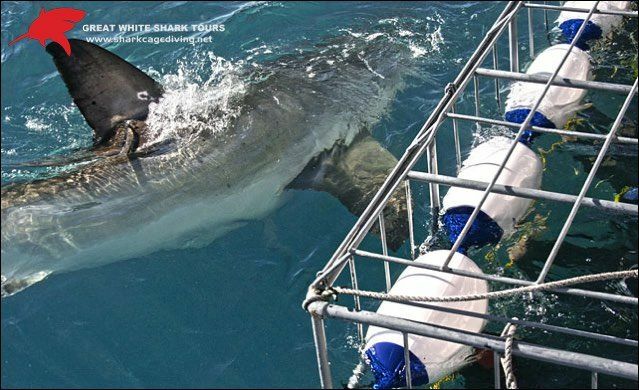 White sharks and tuna have heat-generating muscles. Most other fishes are entirely cold-blooded. 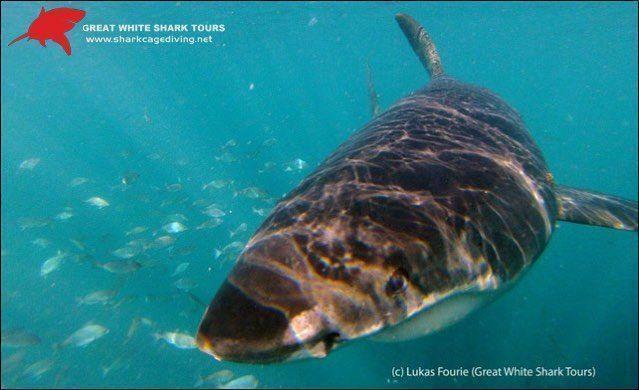 Great White Sharks can heal their wounds & have an incredibly strong tolerance to injury and illness.A severe case was a white shark dubbed ‘Prop' in Gansbaai who was nearly split in half by a boat propeller. In 9 months Props’ wounds were entirely healed. Great White Sharks have never been filmed mating. 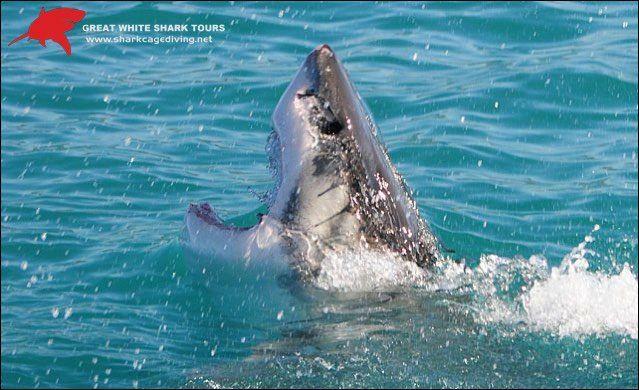 However, many female white sharks are seen with bite wounds along the gill areas (above!) – a tell-tale sign of shark mating! Because there is nothing to hang onto, when the male shark senses a female is ovulating they approach, and if she can’t fight them off they will bite her (usually her fins) and dig in. Then they contort around and mate. The resulting wounds can be deep and leave nasty scarring. 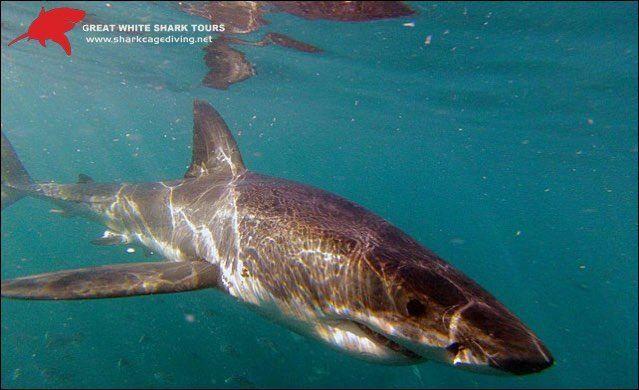 Gansbaai white sharks have been documented in Mozambique, near Marion Island, Madagascar, even Western Australia! Where do sharks give birth? NO ONE knows because Great White Sharks have never been observed giving birth. 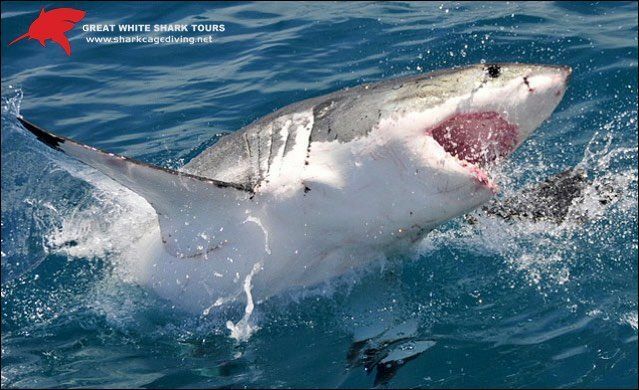 Great White Sharks do not have black, beady killer eyes. They actually have beautiful blue eyes. The iris of a white shark is not black, it’s a very dark blue. Great White Sharks do not produce noises. Body arching, jaw gaping and other postures are specific social tactics they use to communicate. Why does a shark’s skin feel like sandpaper? Sharks don’t have scales like other fish, instead, their skin is covered with tiny points called denticles or “skin teeth”. In olden times carpenters used sheets of dried sharkskin for sandpaper. 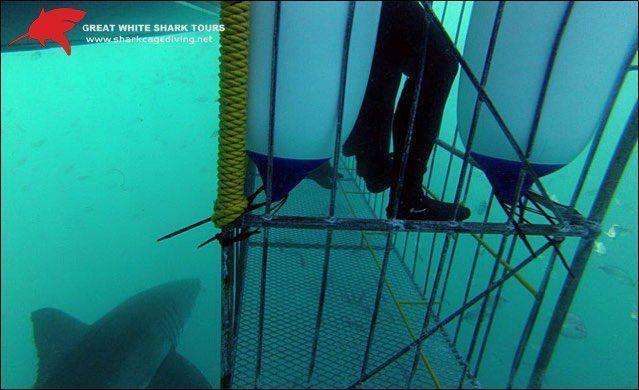 Shark or human- who has the bigger brain? Compared to a human brain, the brain of a Great White Shark is relatively small. However, it is capable of processing complex information about its’ surroundings. Humans have 5 senses but sharks have a 6th electro-sense. Electrical senses travel back and forth along the sharks’ spinal cord sending sensory signals to all parts of the body. When do sharks stop to take a breath? White sharks must swim to breathe. They open their mouths so that the oxygen rich water flows across the gills and out through the paired gill slits on both sides. If this movement stops, they suffocate. Do sharks grow new teeth? The teeth of a great white shark are triangular with serrated edges for cutting. Their jaws are lined with dozens of razor sharp teeth. Behind every row are several rows of replacements. The older teeth snap and new teeth develop on the inside jaw. How does a shark thrust its jaw forward? Sharks have powerful upper and lower jaws. Gill arches and vertebral column are made of firm but flexible cartilage. The upper jaw is loosely suspended from the skull by more cartilage. This unusual system lets the shark detach its jaw from its skull to drop down and thrust its jaw forward, taking large powerful bites from its prey. They can sense electrical impulses through pores all over their nose and head called Ampullae of Lorenzini. They can detect tiny differences in pressure through another series of pores called the lateral line that runs down the side of their body to their tail. 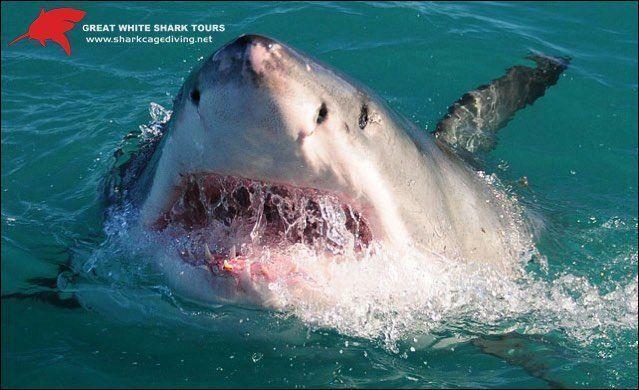 What are the small pores on the nose of a great white shark? Ampullaea of Lorenzini is small sensory pores scattered over the shark’s body and clustered around its head. It contains a jellylike substance and detects bio-electricity- weak electrical currents produced by all living things. By honing in on bio-electric pulses, some sharks can locate prey that is well hidden or even buried beneath the seabed. An active shark has about 1500 Ampullaea of Lorenzini on its head. Sharks cannot swim backwards or stop suddenly. The in vertebra is made up of discs and strung like beads on the spinal cord. This arrangement gives flexibility to its back and allows the shark to move its tail from side to side. 3m is an important size for sharks. Animals greater than 3m are likely reproductively mature animals. If these animals are killed, it could damage the reproductive capability of the population. 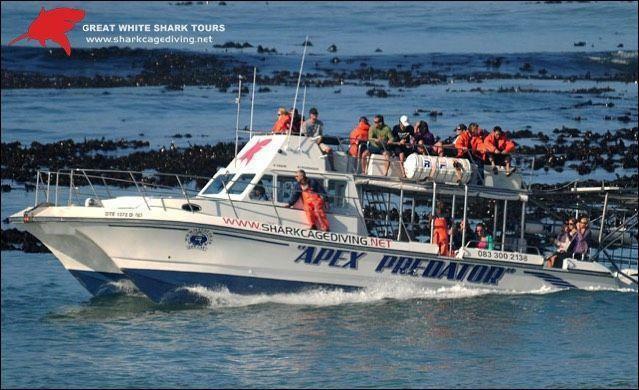 How big do white sharks get in South Africa? 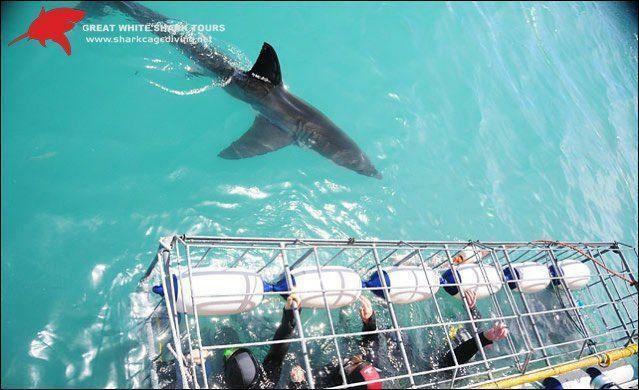 The largest Great WhiteShark ever caught and accurately measured in South Africa was 5.9m in length. 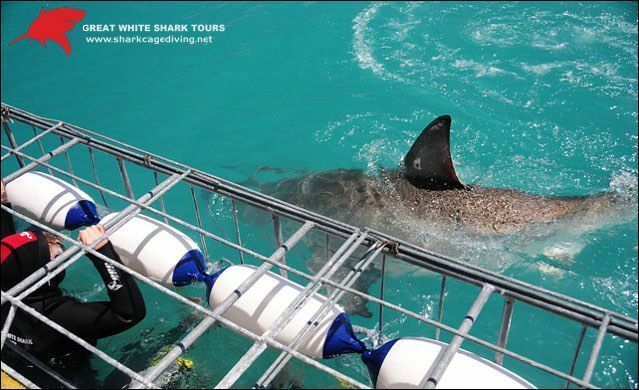 This shark was caught off DangerPoint of Gansbaai (not too far from our cage diving area!). Research suggests they can't see the normal spectrum of colors—though their ability to smell blood in the water probably renders an ability to see red pointless anyway. Shark teeth are covered in fluoride, making them cavity-resistant. The enamel is made up of a chemical called fluorapatite, which is resistant to acid produced by bacteria. This, combined with the fact that most sharks replace their teeth throughout their lives, means that sharks have excellent dental health. *All information supplied by marine biologists.